Tsiklon, its successor, Parus, and Sfera all used the KAUR-1 bus and were similar in appearance. Russian navigation satellite. Military satellite which provided navigation information and store-dump radio communications to Soviet naval forces and ballistic missile submarines. Navigation, data relay satellite built by NPO Prikladnoi Mekhaniki (NPO PM), Russia. Launched 1974 - 2010. Used KAUR-1 bus. AKA: 11F627;Tsikada-M;Tsiklon-B. Status: Operational 1974. First Launch: 1974-12-26. Last Launch: 2010-04-27. Number: 100 . Gross mass: 825 kg (1,818 lb). Experimental flights of equipment components began in 1967, but development was protracted due to the difficulty in developing software that could achieve acceptable positional accuracy levels. Flight trials began in 1974 and the system was finally accepted into military service in 1976. The overall system was designated Tsiklon-B, replacing the Tsiklon series put into service in the 1960's/ The satellite was designed by Reshetnev; the navigation and control system was by NII Radiopribor (Ivanov, Chief Designer, L I Gusev, Director); with communications systems by MNIIRS MPSS (Nesvist). 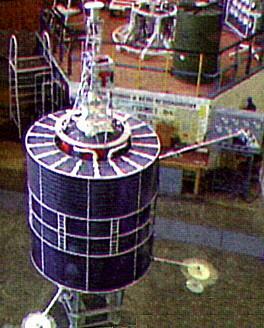 The Kosmos-3M launch vehicle was used to put individual satellites in orbit. Experimental flights began in 1967 in order to develop a system meeting the required tactical and operational characteristics. Parus used the basic KAUR-1 bus, consisting of a 2.035 m diameter cylindrical spacecraft body, with solar cells and radiators of the thermostatic temperature regulating system mounted on the exterior. Orientation was by a single-axis magneto-gravitational (gravity gradient boom) passive system. The hermetically sealed compartment had the equipment mounted in cruciform bays, with the chemical batteries protecting the radio and guidance equipment mounted at the center. The operational satellite constellation consisted of a minimum of six operational satellites, each deployed in one of six planes, spaced 30 degrees apart. Usually one active satellite and one in-space spare was maintained in each plane. Typical lifetime was 18 to 24 months. The signals were supplemented by the very similar civilian Tsikada system, which was in four planes 45 degrees apart. The satellites transmitted Doppler-shifted VHF transmissions at around 150 and 400 MHz of their position and orbital characteristics. The naval receivers would use this data from several satellites to calculate their position to within 100 m.
Electric System: 0.20 average kW. Family: Medium earth orbit, Navigation, Technology. Country: Russia. Launch Vehicles: R-14, Kosmos 3, Kosmos 11K65M, R-29, Volna. Launch Sites: Plesetsk, Barents Sea Launch Area, Plesetsk LC132/2, Plesetsk LC132/1, Plesetsk LC133/3. Agency: MO, Reshetnev bureau. Bibliography: 102, 107, 2, 276, 296, 4, 449, 552, 554, 6, 6774, 12943, 12944. 1974 December 26 - . 12:00 GMT - . Launch Site: Plesetsk. Launch Complex: Plesetsk LC132/1. LV Family: R-14. Launch Vehicle: Kosmos 11K65M. Cosmos 700 - . Mass: 810 kg (1,780 lb). Nation: Russia. Agency: MO. Class: Navigation. Type: Navigation satellite. Spacecraft Bus: KAUR-1. Spacecraft: Parus. USAF Sat Cat: 7593 . COSPAR: 1974-105A. Apogee: 994 km (617 mi). Perigee: 960 km (590 mi). Inclination: 83.00 deg. Period: 104.60 min. Military navigation satellite..
1975 April 11 - . 07:57 GMT - . Launch Site: Plesetsk. Launch Complex: Plesetsk LC132/1. LV Family: R-14. Launch Vehicle: Kosmos 11K65M. Cosmos 726 - . Mass: 810 kg (1,780 lb). Nation: Russia. Agency: MO. Class: Navigation. Type: Navigation satellite. Spacecraft Bus: KAUR-1. Spacecraft: Parus. USAF Sat Cat: 7736 . COSPAR: 1975-028A. Apogee: 991 km (615 mi). Perigee: 952 km (591 mi). Inclination: 83.00 deg. Period: 104.50 min. Military navigation satellite..
1975 August 14 - . 13:29 GMT - . Launch Site: Plesetsk. Launch Complex: Plesetsk LC132/1. LV Family: R-14. Launch Vehicle: Kosmos 11K65M. Cosmos 755 - . Mass: 810 kg (1,780 lb). Nation: Russia. Agency: MO. Class: Navigation. Type: Navigation satellite. Spacecraft Bus: KAUR-1. Spacecraft: Parus. USAF Sat Cat: 8072 . COSPAR: 1975-074A. Apogee: 1,008 km (626 mi). Perigee: 966 km (600 mi). Inclination: 82.90 deg. Period: 104.80 min. Military navigation satellite..
1975 November 4 - . 10:13 GMT - . Launch Site: Plesetsk. Launch Complex: Plesetsk LC132/1. LV Family: R-14. Launch Vehicle: Kosmos 11K65M. Cosmos 778 - . Mass: 810 kg (1,780 lb). Nation: Russia. Agency: MO. Class: Navigation. Type: Navigation satellite. Spacecraft Bus: KAUR-1. Spacecraft: Parus. USAF Sat Cat: 8419 . COSPAR: 1975-103A. Apogee: 1,001 km (621 mi). Perigee: 968 km (601 mi). Inclination: 83.00 deg. Period: 104.80 min. Military navigation satellite..
1976 January 20 - . 17:08 GMT - . Launch Site: Plesetsk. Launch Complex: Plesetsk LC132/1. LV Family: R-14. Launch Vehicle: Kosmos 11K65M. Cosmos 789 - . Mass: 810 kg (1,780 lb). Nation: Russia. Agency: MO. Class: Navigation. Type: Navigation satellite. Spacecraft Bus: KAUR-1. Spacecraft: Parus. USAF Sat Cat: 8591 . COSPAR: 1976-005A. Apogee: 1,013 km (629 mi). Perigee: 966 km (600 mi). Inclination: 83.00 deg. Period: 104.90 min. Military navigation satellite..
1976 October 29 - . 12:40 GMT - . Launch Site: Plesetsk. Launch Complex: Plesetsk LC132/2. LV Family: R-14. Launch Vehicle: Kosmos 11K65M. Cosmos 864 - . Mass: 810 kg (1,780 lb). Nation: Russia. Agency: MO. Class: Navigation. Type: Navigation satellite. Spacecraft Bus: KAUR-1. Spacecraft: Parus. USAF Sat Cat: 9509 . COSPAR: 1976-108A. Apogee: 1,005 km (624 mi). Perigee: 958 km (595 mi). Inclination: 82.90 deg. Period: 104.70 min. Military navigation satellite..
1976 December 28 - . 07:50 GMT - . Launch Site: Plesetsk. Launch Complex: Plesetsk LC132/1. LV Family: R-14. Launch Vehicle: Kosmos 11K65M. Cosmos 887 - . Mass: 810 kg (1,780 lb). Nation: Russia. Agency: MO. Class: Navigation. Type: Navigation satellite. Spacecraft Bus: KAUR-1. Spacecraft: Parus. USAF Sat Cat: 9637 . COSPAR: 1976-128A. Apogee: 1,011 km (628 mi). Perigee: 947 km (588 mi). Inclination: 82.90 deg. Period: 104.70 min. Military navigation satellite..
1977 February 21 - . 17:20 GMT - . Launch Site: Plesetsk. Launch Complex: Plesetsk LC132/1. LV Family: R-14. Launch Vehicle: Kosmos 11K65M. Cosmos 894 - . Mass: 810 kg (1,780 lb). Nation: Russia. Agency: MO. Class: Navigation. Type: Navigation satellite. Spacecraft Bus: KAUR-1. Spacecraft: Parus. USAF Sat Cat: 9846 . COSPAR: 1977-013A. Apogee: 1,010 km (620 mi). Perigee: 963 km (598 mi). Inclination: 82.90 deg. Period: 104.80 min. Military navigation satellite..
1977 July 13 - . 05:02 GMT - . Launch Site: Plesetsk. Launch Complex: Plesetsk LC132/1. LV Family: R-14. Launch Vehicle: Kosmos 11K65M. Cosmos 928 - . Mass: 810 kg (1,780 lb). Nation: Russia. Agency: MO. Class: Navigation. Type: Navigation satellite. Spacecraft Bus: KAUR-1. Spacecraft: Parus. USAF Sat Cat: 10141 . COSPAR: 1977-064A. Apogee: 1,006 km (625 mi). Perigee: 949 km (589 mi). Inclination: 83.00 deg. Period: 104.60 min. Military navigation satellite..
1977 September 13 - . 19:59 GMT - . Launch Site: Plesetsk. Launch Complex: Plesetsk LC132/1. LV Family: R-14. Launch Vehicle: Kosmos 11K65M. Cosmos 951 - . Mass: 810 kg (1,780 lb). Nation: Russia. Agency: MO. Class: Navigation. Type: Navigation satellite. Spacecraft Bus: KAUR-1. Spacecraft: Parus. USAF Sat Cat: 10352 . COSPAR: 1977-087A. Apogee: 1,010 km (620 mi). Perigee: 962 km (597 mi). Inclination: 83.00 deg. Period: 104.80 min. Military navigation satellite..
1977 December 23 - . 16:24 GMT - . Launch Site: Plesetsk. Launch Complex: Plesetsk LC132/1. LV Family: R-14. Launch Vehicle: Kosmos 11K65M. Cosmos 971 - . Mass: 810 kg (1,780 lb). Nation: Russia. Agency: MO. Class: Navigation. Type: Navigation satellite. Spacecraft Bus: KAUR-1. Spacecraft: Parus. USAF Sat Cat: 10536 . COSPAR: 1977-122A. Apogee: 1,004 km (623 mi). Perigee: 975 km (605 mi). Inclination: 82.90 deg. Period: 104.90 min. Military navigation satellite..
1978 January 17 - . 03:26 GMT - . Launch Site: Plesetsk. Launch Complex: Plesetsk LC132/1. LV Family: R-14. Launch Vehicle: Kosmos 11K65M. Cosmos 985 - . Mass: 810 kg (1,780 lb). Nation: Russia. Agency: MO. Class: Navigation. Type: Navigation satellite. Spacecraft Bus: KAUR-1. Spacecraft: Parus. USAF Sat Cat: 10599 . COSPAR: 1978-007A. Apogee: 1,015 km (630 mi). Perigee: 938 km (582 mi). Inclination: 82.90 deg. Period: 104.60 min. Military navigation satellite..
1978 February 28 - . 06:43 GMT - . Launch Site: Plesetsk. Launch Complex: Plesetsk LC132/2. LV Family: R-14. Launch Vehicle: Kosmos 11K65M. Cosmos 991 - . Mass: 810 kg (1,780 lb). Nation: Russia. Agency: MO. Class: Navigation. Type: Navigation satellite. Spacecraft Bus: KAUR-1. Spacecraft: Parus. USAF Sat Cat: 10692 . COSPAR: 1978-022A. Apogee: 1,004 km (623 mi). Perigee: 952 km (591 mi). Inclination: 83.00 deg. Period: 104.70 min. Military navigation satellite..
1978 March 28 - . 01:30 GMT - . Launch Site: Plesetsk. Launch Complex: Plesetsk LC132/1. LV Family: R-14. Launch Vehicle: Kosmos 11K65M. Cosmos 996 - . Mass: 810 kg (1,780 lb). Nation: Russia. Agency: MO. Class: Navigation. Type: Navigation satellite. Spacecraft Bus: KAUR-1. Spacecraft: Parus. USAF Sat Cat: 10744 . COSPAR: 1978-031A. Apogee: 1,006 km (625 mi). Perigee: 949 km (589 mi). Inclination: 82.90 deg. Period: 104.60 min. Military navigation satellite..
1978 May 23 - . 16:57 GMT - . Launch Site: Plesetsk. Launch Complex: Plesetsk LC132/1. Launch Pad: LC132/1?. LV Family: R-14. Launch Vehicle: Kosmos 11K65M. Cosmos 1011 - . Mass: 810 kg (1,780 lb). Nation: Russia. Agency: MO. Class: Navigation. Type: Navigation satellite. Spacecraft Bus: KAUR-1. Spacecraft: Parus. USAF Sat Cat: 10917 . COSPAR: 1978-053A. Apogee: 1,008 km (626 mi). Perigee: 956 km (594 mi). Inclination: 82.90 deg. Period: 104.70 min. Military navigation satellite..
1978 December 20 - . 20:43 GMT - . Launch Site: Plesetsk. Launch Complex: Plesetsk LC132/1. LV Family: R-14. Launch Vehicle: Kosmos 11K65M. Cosmos 1064 - . Mass: 1,025 kg (2,259 lb). Nation: Russia. Agency: MO. Class: Navigation. Type: Navigation satellite. Spacecraft Bus: KAUR-1. Spacecraft: Parus. Decay Date: 1989-11-12 . USAF Sat Cat: 11161 . COSPAR: 1978-119A. Apogee: 467 km (290 mi). Perigee: 333 km (206 mi). Inclination: 82.90 deg. Period: 92.60 min. Probable failure. Military navigation satellite..
1979 January 16 - . 17:37 GMT - . Launch Site: Plesetsk. Launch Complex: Plesetsk LC132/1. LV Family: R-14. Launch Vehicle: Kosmos 11K65M. Cosmos 1072 - . Mass: 810 kg (1,780 lb). Nation: Russia. Agency: MO. Class: Navigation. Type: Navigation satellite. Spacecraft Bus: KAUR-1. Spacecraft: Parus. USAF Sat Cat: 11238 . COSPAR: 1979-003A. Apogee: 1,012 km (628 mi). Perigee: 960 km (590 mi). Inclination: 82.90 deg. Period: 104.80 min. Military navigation satellite..
1979 March 21 - . 04:13 GMT - . Launch Site: Plesetsk. Launch Complex: Plesetsk LC132/2. LV Family: R-14. Launch Vehicle: Kosmos 11K65M. Cosmos 1089 - . Mass: 810 kg (1,780 lb). Nation: Russia. Agency: MO. Class: Navigation. Type: Navigation satellite. Spacecraft Bus: KAUR-1. Spacecraft: Parus. USAF Sat Cat: 11308 . COSPAR: 1979-026A. Apogee: 999 km (620 mi). Perigee: 966 km (600 mi). Inclination: 83.00 deg. Period: 104.70 min. Military navigation satellite..
1979 April 7 - . 06:20 GMT - . Launch Site: Plesetsk. Launch Complex: Plesetsk LC132/1. LV Family: R-14. Launch Vehicle: Kosmos 11K65M. Cosmos 1091 - . Mass: 810 kg (1,780 lb). Nation: Russia. Agency: MO. Class: Navigation. Type: Navigation satellite. Spacecraft Bus: KAUR-1. Spacecraft: Parus. USAF Sat Cat: 11320 . COSPAR: 1979-028A. Apogee: 1,008 km (626 mi). Perigee: 960 km (590 mi). Inclination: 82.90 deg. Period: 104.80 min. Military navigation satellite..
1979 May 31 - . 17:58 GMT - . Launch Site: Plesetsk. Launch Complex: Plesetsk LC132/1. LV Family: R-14. Launch Vehicle: Kosmos 11K65M. Cosmos 1104 - . Mass: 810 kg (1,780 lb). Nation: Russia. Agency: MO. Class: Navigation. Type: Navigation satellite. Spacecraft Bus: KAUR-1. Spacecraft: Parus. USAF Sat Cat: 11378 . COSPAR: 1979-046A. Apogee: 1,005 km (624 mi). Perigee: 956 km (594 mi). Inclination: 83.00 deg. Period: 104.70 min. Military navigation satellite..
1979 October 16 - . 12:17 GMT - . Launch Site: Plesetsk. Launch Complex: Plesetsk LC132/2. LV Family: R-14. Launch Vehicle: Kosmos 11K65M. Cosmos 1141 - . Mass: 810 kg (1,780 lb). Nation: Russia. Agency: MO. Class: Navigation. Type: Navigation satellite. Spacecraft Bus: KAUR-1. Spacecraft: Parus. USAF Sat Cat: 11585 . COSPAR: 1979-090A. Apogee: 998 km (620 mi). Perigee: 954 km (592 mi). Inclination: 83.00 deg. Period: 104.60 min. Military navigation satellite..
1980 January 14 - . 19:49 GMT - . Launch Site: Plesetsk. Launch Complex: Plesetsk LC132/2. LV Family: R-14. Launch Vehicle: Kosmos 11K65M. Cosmos 1150 - . Mass: 810 kg (1,780 lb). Nation: Russia. Agency: MO. Class: Navigation. Type: Navigation satellite. Spacecraft Bus: KAUR-1. Spacecraft: Parus. USAF Sat Cat: 11667 . COSPAR: 1980-003A. Apogee: 1,012 km (628 mi). Perigee: 964 km (599 mi). Inclination: 83.00 deg. Period: 104.90 min. Military navigation satellite..
1980 January 25 - . 20:36 GMT - . Launch Site: Plesetsk. Launch Complex: Plesetsk LC132/2. LV Family: R-14. Launch Vehicle: Kosmos 11K65M. Cosmos 1153 - . Mass: 810 kg (1,780 lb). Nation: Russia. Agency: MO. Class: Navigation. Type: Navigation satellite. Spacecraft Bus: KAUR-1. Spacecraft: Parus. USAF Sat Cat: 11680 . COSPAR: 1980-007A. Apogee: 1,014 km (630 mi). Perigee: 961 km (597 mi). Inclination: 82.90 deg. Period: 104.90 min. Military navigation satellite..
1980 May 20 - . 09:21 GMT - . Launch Site: Plesetsk. Launch Complex: Plesetsk LC132/2. LV Family: R-14. Launch Vehicle: Kosmos 11K65M. Cosmos 1181 - . Mass: 810 kg (1,780 lb). Nation: Russia. Agency: MO. Class: Navigation. Type: Navigation satellite. Spacecraft Bus: KAUR-1. Spacecraft: Parus. USAF Sat Cat: 11803 . COSPAR: 1980-039A. Apogee: 1,004 km (623 mi). Perigee: 969 km (602 mi). Inclination: 82.90 deg. Period: 104.80 min. Military navigation satellite..
1980 December 5 - . 04:23 GMT - . Launch Site: Plesetsk. Launch Complex: Plesetsk LC132/1. LV Family: R-14. Launch Vehicle: Kosmos 11K65M. Cosmos 1225 - . Mass: 810 kg (1,780 lb). Nation: Russia. Agency: MO. Class: Navigation. Type: Navigation satellite. Spacecraft Bus: KAUR-1. Spacecraft: Parus. USAF Sat Cat: 12087 . COSPAR: 1980-097A. Apogee: 1,025 km (636 mi). Perigee: 945 km (587 mi). Inclination: 82.90 deg. Period: 104.80 min. Military navigation satellite..
1981 February 12 - . 18:21 GMT - . Launch Site: Plesetsk. Launch Complex: Plesetsk LC132/1. LV Family: R-14. Launch Vehicle: Kosmos 11K65M. Cosmos 1244 - . Mass: 810 kg (1,780 lb). Nation: Russia. Agency: MO. Class: Navigation. Type: Navigation satellite. Spacecraft Bus: KAUR-1. Spacecraft: Parus. USAF Sat Cat: 12297 . COSPAR: 1981-013A. Apogee: 1,006 km (625 mi). Perigee: 960 km (590 mi). Inclination: 83.00 deg. Period: 104.80 min. Military navigation satellite. Replaced Cosmos 1104..
1981 June 4 - . 15:41 GMT - . Launch Site: Plesetsk. Launch Complex: Plesetsk LC132/2. LV Family: R-14. Launch Vehicle: Kosmos 11K65M. Cosmos 1275 - . Mass: 810 kg (1,780 lb). Nation: Russia. Agency: MO. Class: Navigation. Type: Navigation satellite. Spacecraft Bus: KAUR-1. Spacecraft: Parus. Decay Date: 1981-09-30 . USAF Sat Cat: 12504 . COSPAR: 1981-053A. Apogee: 1,005 km (624 mi). Perigee: 954 km (592 mi). Inclination: 83.00 deg. Period: 104.70 min. Military navigation satellite. Replaced Cosmos 1141..
1981 August 12 - . 05:46 GMT - . Launch Site: Plesetsk. Launch Complex: Plesetsk LC132/2. LV Family: R-14. Launch Vehicle: Kosmos 11K65M. Cosmos 1295 - . Mass: 700 kg (1,540 lb). Nation: Russia. Agency: MO. Class: Navigation. Type: Navigation satellite. Spacecraft Bus: KAUR-1. Spacecraft: Parus. USAF Sat Cat: 12681 . COSPAR: 1981-077A. Apogee: 1,009 km (626 mi). Perigee: 947 km (588 mi). Inclination: 82.90 deg. Period: 104.70 min. Military navigation satellite. Replaced Cosmos 1181..
1981 September 18 - . 03:34 GMT - . Launch Site: Plesetsk. Launch Complex: Plesetsk LC132/1. LV Family: R-14. Launch Vehicle: Kosmos 11K65M. Cosmos 1308 - . Mass: 700 kg (1,540 lb). Nation: Russia. Agency: MO. Class: Navigation. Type: Navigation satellite. Spacecraft Bus: KAUR-1. Spacecraft: Parus. USAF Sat Cat: 12835 . COSPAR: 1981-091A. Apogee: 1,003 km (623 mi). Perigee: 960 km (590 mi). Inclination: 82.90 deg. Period: 104.70 min. Military navigation satellite. Replaced Cosmos 1275..
1982 January 14 - . 07:51 GMT - . Launch Site: Plesetsk. Launch Complex: Plesetsk LC132/2. LV Family: R-14. Launch Vehicle: Kosmos 11K65M. Cosmos 1333 - . Mass: 810 kg (1,780 lb). Nation: Russia. Agency: MO. Class: Navigation. Type: Navigation satellite. Spacecraft Bus: KAUR-1. Spacecraft: Parus. USAF Sat Cat: 13033 . COSPAR: 1982-003A. Apogee: 1,014 km (630 mi). Perigee: 964 km (599 mi). Inclination: 82.90 deg. Period: 104.90 min. Military navigation satellite. Replaced Cosmos 1150..
1982 March 24 - . 19:47 GMT - . Launch Site: Plesetsk. Launch Complex: Plesetsk LC132/1. LV Family: R-14. Launch Vehicle: Kosmos 11K65M. Cosmos 1344 - . Mass: 810 kg (1,780 lb). Nation: Russia. Agency: MO. Class: Navigation. Type: Navigation satellite. Spacecraft Bus: KAUR-1. Spacecraft: Parus. USAF Sat Cat: 13110 . COSPAR: 1982-024A. Apogee: 1,007 km (625 mi). Perigee: 967 km (600 mi). Inclination: 82.90 deg. Period: 104.80 min. Military navigation satellite. Replaced Cosmos 1244..
1982 April 8 - . 00:15 GMT - . Launch Site: Plesetsk. Launch Complex: Plesetsk LC132/2. LV Family: R-14. Launch Vehicle: Kosmos 11K65M. Cosmos 1349 - . Mass: 810 kg (1,780 lb). Nation: Russia. Agency: MO. Class: Navigation. Type: Navigation satellite. Spacecraft Bus: KAUR-1. Spacecraft: Parus. USAF Sat Cat: 13127 . COSPAR: 1982-030A. Apogee: 1,009 km (626 mi). Perigee: 966 km (600 mi). Inclination: 82.90 deg. Period: 104.80 min. Military navigation satellite. Replaced Cosmos 1153..
1982 June 18 - . 11:58 GMT - . Launch Site: Plesetsk. Launch Complex: Plesetsk LC132/2. LV Family: R-14. Launch Vehicle: Kosmos 11K65M. Cosmos 1380 - . Mass: 810 kg (1,780 lb). Nation: Russia. Agency: MO. Class: Navigation. Type: Navigation satellite. Spacecraft Bus: KAUR-1. Spacecraft: Parus. Decay Date: 1982-06-27 . USAF Sat Cat: 13282 . COSPAR: 1982-061A. Apogee: 721 km (448 mi). Perigee: 137 km (85 mi). Inclination: 82.90 deg. Period: 93.20 min. Upper stage failure. Was to have replaced Cosmos 1225..
1982 July 7 - . 09:47 GMT - . Launch Site: Plesetsk. Launch Complex: Plesetsk LC132/1. LV Family: R-14. Launch Vehicle: Kosmos 11K65M. Cosmos 1386 - . Mass: 810 kg (1,780 lb). Nation: Russia. Agency: MO. Class: Navigation. Type: Navigation satellite. Spacecraft Bus: KAUR-1. Spacecraft: Parus. USAF Sat Cat: 13353 . COSPAR: 1982-069A. Apogee: 1,008 km (626 mi). Perigee: 948 km (589 mi). Inclination: 83.00 deg. Period: 104.70 min. Military navigation satellite. Replaced Cosmos 1225..
1982 October 19 - . 05:58 GMT - . Launch Site: Plesetsk. Launch Complex: Plesetsk LC132/1. LV Family: R-14. Launch Vehicle: Kosmos 11K65M. Cosmos 1417 - . Mass: 810 kg (1,780 lb). Nation: Russia. Agency: MO. Class: Navigation. Type: Navigation satellite. Spacecraft Bus: KAUR-1. Spacecraft: Parus. USAF Sat Cat: 13617 . COSPAR: 1982-102A. Apogee: 1,009 km (626 mi). Perigee: 956 km (594 mi). Inclination: 83.00 deg. Period: 104.70 min. Military navigation satellite. Replaced Cosmos 1308..
1983 January 12 - . 14:02 GMT - . Launch Site: Plesetsk. Launch Complex: Plesetsk LC132/2. LV Family: R-14. Launch Vehicle: Kosmos 11K65M. Cosmos 1428 - . Mass: 810 kg (1,780 lb). Nation: Russia. Agency: MO. Class: Navigation. Type: Navigation satellite. Spacecraft Bus: KAUR-1. Spacecraft: Parus. USAF Sat Cat: 13757 . COSPAR: 1983-001A. Apogee: 1,001 km (621 mi). Perigee: 952 km (591 mi). Inclination: 82.90 deg. Period: 104.60 min. Military navigation satellite. Replaced Cosmos 1333..
1983 March 30 - . 01:10 GMT - . Launch Site: Plesetsk. Launch Complex: Plesetsk LC132/1. LV Family: R-14. Launch Vehicle: Kosmos 11K65M. Cosmos 1448 - . Mass: 810 kg (1,780 lb). Nation: Russia. Agency: MO. Class: Navigation. Type: Navigation satellite. Spacecraft Bus: KAUR-1. Spacecraft: Parus. USAF Sat Cat: 13949 . COSPAR: 1983-023A. Apogee: 1,003 km (623 mi). Perigee: 957 km (594 mi). Inclination: 83.00 deg. Period: 104.70 min. Military navigation satellite. Replaced Cosmos 1344..
1983 May 6 - . 03:00 GMT - . Launch Site: Plesetsk. Launch Complex: Plesetsk LC132/1. Launch Pad: LC132?/pad?. LV Family: R-14. Launch Vehicle: Kosmos 11K65M. Cosmos 1459 - . Mass: 810 kg (1,780 lb). Nation: Russia. Agency: MO. Class: Navigation. Type: Navigation satellite. Spacecraft Bus: KAUR-1. Spacecraft: Parus. USAF Sat Cat: 14057 . COSPAR: 1983-042A. Apogee: 1,014 km (630 mi). Perigee: 941 km (584 mi). Inclination: 83.00 deg. Period: 104.60 min. Military navigation satellite. Replaced Cosmos 1349..
1983 May 24 - . 02:59 GMT - . Launch Site: Plesetsk. Launch Complex: Plesetsk LC132/1. LV Family: R-14. Launch Vehicle: Kosmos 11K65M. Cosmos 1464 - . Mass: 810 kg (1,780 lb). Nation: Russia. Agency: MO. Class: Navigation. Type: Navigation satellite. Spacecraft Bus: KAUR-1. Spacecraft: Parus. USAF Sat Cat: 14084 . COSPAR: 1983-048A. Apogee: 1,006 km (625 mi). Perigee: 964 km (599 mi). Inclination: 83.00 deg. Period: 104.80 min. Military navigation satellite. Replaced Cosmos 1295..
1983 December 8 - . 06:13 GMT - . Launch Site: Plesetsk. Launch Complex: Plesetsk LC132/2. LV Family: R-14. Launch Vehicle: Kosmos 11K65M. Cosmos 1513 - . Mass: 810 kg (1,780 lb). Nation: Russia. Agency: MO. Class: Navigation. Type: Navigation satellite. Spacecraft Bus: KAUR-1. Spacecraft: Parus. USAF Sat Cat: 14546 . COSPAR: 1983-120A. Apogee: 1,014 km (630 mi). Perigee: 957 km (594 mi). Inclination: 82.90 deg. Period: 104.80 min. Military navigation satellite. Replaced Cosmos 1417..
1984 January 11 - . 18:08 GMT - . Launch Site: Plesetsk. Launch Complex: Plesetsk LC132/2. LV Family: R-14. Launch Vehicle: Kosmos 11K65M. Cosmos 1531 - . Mass: 810 kg (1,780 lb). Nation: Russia. Agency: MO. Class: Navigation. Type: Navigation satellite. Spacecraft Bus: KAUR-1. Spacecraft: Parus. USAF Sat Cat: 14624 . COSPAR: 1984-003A. Apogee: 1,006 km (625 mi). Perigee: 980 km (600 mi). Inclination: 82.90 deg. Period: 105.00 min. Military navigation satellite. Replaced Cosmos 1386..
1984 February 2 - . 17:38 GMT - . Launch Site: Plesetsk. Launch Complex: Plesetsk LC132/1. LV Family: R-14. Launch Vehicle: Kosmos 11K65M. Cosmos 1535 - . Mass: 810 kg (1,780 lb). Nation: Russia. Agency: MO. Class: Navigation. Type: Navigation satellite. Spacecraft Bus: KAUR-1. Spacecraft: Parus. USAF Sat Cat: 14679 . COSPAR: 1984-010A. Apogee: 1,013 km (629 mi). Perigee: 953 km (592 mi). Inclination: 83.00 deg. Period: 104.80 min. Military navigation satellite. Replaced Cosmos 1428..
1984 May 11 - . 06:19 GMT - . Launch Site: Plesetsk. Launch Complex: Plesetsk LC132/1. Launch Pad: LC132?/pad?. LV Family: R-14. Launch Vehicle: Kosmos 11K65M. Cosmos 1550 - . Mass: 810 kg (1,780 lb). Nation: Russia. Agency: MO. Class: Navigation. Type: Navigation satellite. Spacecraft Bus: KAUR-1. Spacecraft: Parus. USAF Sat Cat: 14965 . COSPAR: 1984-043A. Apogee: 1,009 km (626 mi). Perigee: 973 km (604 mi). Inclination: 83.00 deg. Period: 104.90 min. Military navigation satellite. Replaced Csmos 1535..
1984 June 27 - . 04:59 GMT - . Launch Site: Plesetsk. Launch Complex: Plesetsk LC132/2. LV Family: R-14. Launch Vehicle: Kosmos 11K65M. Cosmos 1577 - . Mass: 810 kg (1,780 lb). Nation: Russia. Agency: MO. Class: Navigation. Type: Navigation satellite. Spacecraft Bus: KAUR-1. Spacecraft: Parus. USAF Sat Cat: 15077 . COSPAR: 1984-067A. Apogee: 1,007 km (625 mi). Perigee: 956 km (594 mi). Inclination: 83.00 deg. Period: 104.70 min. Military navigation satellite. Replaced Cosmos 1464..
1984 September 13 - . 15:54 GMT - . Launch Site: Plesetsk. Launch Complex: Plesetsk LC132/1. LV Family: R-14. Launch Vehicle: Kosmos 11K65M. Cosmos 1598 - . Mass: 810 kg (1,780 lb). Nation: Russia. Agency: MO. Class: Navigation. Type: Navigation satellite. Spacecraft Bus: KAUR-1. Spacecraft: Parus. USAF Sat Cat: 15292 . COSPAR: 1984-100A. Apogee: 1,013 km (629 mi). Perigee: 967 km (600 mi). Inclination: 82.90 deg. Period: 104.90 min. Military navigation satellite. Replaced Cosmos 1550..
1984 October 11 - . 14:43 GMT - . Launch Site: Plesetsk. Launch Complex: Plesetsk LC132/2. LV Family: R-14. Launch Vehicle: Kosmos 11K65M. Cosmos 1605 - . Mass: 810 kg (1,780 lb). Nation: Russia. Agency: MO. Class: Navigation. Type: Navigation satellite. Spacecraft Bus: KAUR-1. Spacecraft: Parus. USAF Sat Cat: 15359 . COSPAR: 1984-109A. Apogee: 1,015 km (630 mi). Perigee: 949 km (589 mi). Inclination: 82.90 deg. Period: 104.70 min. Military navigation satellite. Replaced Cosmos 1459..
1984 November 15 - . 06:40 GMT - . Launch Site: Plesetsk. Launch Complex: Plesetsk LC132/1. LV Family: R-14. Launch Vehicle: Kosmos 11K65M. Cosmos 1610 - . Mass: 810 kg (1,780 lb). Nation: Russia. Agency: MO. Class: Navigation. Type: Navigation satellite. Spacecraft Bus: KAUR-1. Spacecraft: Parus. USAF Sat Cat: 15398 . COSPAR: 1984-118A. Apogee: 1,012 km (628 mi). Perigee: 963 km (598 mi). Inclination: 83.00 deg. Period: 104.90 min. Military navigation satellite. Replaced Cosmos 1531..
1985 February 1 - . 19:36 GMT - . Launch Site: Plesetsk. Launch Complex: Plesetsk LC132/2. LV Family: R-14. Launch Vehicle: Kosmos 11K65M. Cosmos 1627 - . Mass: 810 kg (1,780 lb). Nation: Russia. Agency: MO. Class: Navigation. Type: Navigation satellite. Spacecraft Bus: KAUR-1. Spacecraft: Parus. USAF Sat Cat: 15505 . COSPAR: 1985-011A. Apogee: 1,015 km (630 mi). Perigee: 955 km (593 mi). Inclination: 82.90 deg. Period: 104.80 min. Military navigation satellite. Replaced Cosmos 1448..
1985 March 14 - . 01:09 GMT - . Launch Site: Plesetsk. Launch Complex: Plesetsk LC132/2. LV Family: R-14. Launch Vehicle: Kosmos 11K65M. Cosmos 1634 - . Mass: 810 kg (1,780 lb). Nation: Russia. Agency: MO. Class: Navigation. Type: Navigation satellite. Spacecraft Bus: KAUR-1. Spacecraft: Parus. USAF Sat Cat: 15597 . COSPAR: 1985-022A. Apogee: 1,009 km (626 mi). Perigee: 957 km (594 mi). Inclination: 82.90 deg. Period: 104.80 min. Military navigation satellite. Replaced Cosmos 1513..
1985 October 23 - . 17:24 GMT - . Launch Site: Plesetsk. Launch Complex: Plesetsk LC133/3. LV Family: R-14. Launch Vehicle: Kosmos 11K65M. FAILURE: Launch vehicle failed to orbit - unknown cause.. Failed Stage: U.
Parus - . Mass: 825 kg (1,818 lb). Nation: Russia. Agency: UNKS. Class: Navigation. Type: Navigation satellite. Spacecraft Bus: KAUR-1. Spacecraft: Parus. 1985 November 28 - . 13:12 GMT - . Launch Site: Plesetsk. Launch Complex: Plesetsk LC133/3. LV Family: R-14. Launch Vehicle: Kosmos 11K65M. Cosmos 1704 - . Mass: 810 kg (1,780 lb). Nation: Russia. Agency: MO. Class: Navigation. Type: Navigation satellite. Spacecraft Bus: KAUR-1. Spacecraft: Parus. USAF Sat Cat: 16291 . COSPAR: 1985-110A. Apogee: 1,007 km (625 mi). Perigee: 962 km (597 mi). Inclination: 82.90 deg. Period: 104.80 min. Military navigation satellite. Replaced Cosmos 1598..
1985 December 19 - . 08:46 GMT - . Launch Site: Plesetsk. Launch Complex: Plesetsk LC132/1. LV Family: R-14. Launch Vehicle: Kosmos 11K65M. Cosmos 1709 - . Mass: 810 kg (1,780 lb). Nation: Russia. Agency: MO. Class: Navigation. Type: Navigation satellite. Spacecraft Bus: KAUR-1. Spacecraft: Parus. USAF Sat Cat: 16368 . COSPAR: 1985-116A. Apogee: 1,012 km (628 mi). Perigee: 958 km (595 mi). Inclination: 82.90 deg. Period: 104.80 min. Military navigation satellite. Replaced Cosmos 1610..
1986 January 16 - . 11:38 GMT - . Launch Site: Plesetsk. Launch Complex: Plesetsk LC132/1. LV Family: R-14. Launch Vehicle: Kosmos 11K65M. Cosmos 1725 - . Mass: 810 kg (1,780 lb). Nation: Russia. Agency: MO. Class: Navigation. Type: Navigation satellite. Spacecraft Bus: KAUR-1. Spacecraft: Parus. USAF Sat Cat: 16493 . COSPAR: 1986-005A. Apogee: 1,002 km (622 mi). Perigee: 967 km (600 mi). Inclination: 82.90 deg. Period: 104.80 min. Military navigation satellite. Replaced Cosmos 1577..
1986 May 23 - . 12:54 GMT - . Launch Site: Plesetsk. Launch Complex: Plesetsk LC132/1. LV Family: R-14. Launch Vehicle: Kosmos 11K65M. Cosmos 1745 - . Mass: 810 kg (1,780 lb). Nation: Russia. Agency: MO. Class: Navigation. Type: Navigation satellite. Spacecraft Bus: KAUR-1. Spacecraft: Parus. USAF Sat Cat: 16727 . COSPAR: 1986-037A. Apogee: 1,010 km (620 mi). Perigee: 962 km (597 mi). Inclination: 83.00 deg. Period: 104.80 min. Military navigation satellite. Replaced Cosmos 1627..
1986 June 18 - . 20:03 GMT - . Launch Site: Plesetsk. Launch Complex: Plesetsk LC132/1. LV Family: R-14. Launch Vehicle: Kosmos 11K65M. Cosmos 1759 - . Mass: 810 kg (1,780 lb). Nation: Russia. Agency: MO. Class: Navigation. Type: Navigation satellite. Spacecraft Bus: KAUR-1. Spacecraft: Parus. USAF Sat Cat: 16798 . COSPAR: 1986-047A. Apogee: 1,001 km (621 mi). Perigee: 965 km (599 mi). Inclination: 82.90 deg. Period: 104.80 min. Military navigation satellite. Replaced Cosmos 1634..
1986 November 24 - . 21:43 GMT - . Launch Site: Plesetsk. Launch Complex: Plesetsk LC132/2. LV Family: R-14. Launch Vehicle: Kosmos 11K65M. Cosmos 1802 - . Mass: 810 kg (1,780 lb). Nation: Russia. Agency: MO. Class: Navigation. Type: Navigation satellite. Spacecraft Bus: KAUR-1. Spacecraft: Parus. USAF Sat Cat: 17159 . COSPAR: 1986-093A. Apogee: 1,022 km (635 mi). Perigee: 960 km (590 mi). Inclination: 82.90 deg. Period: 104.90 min. Military navigation satellite. Replaced Cosmos 1605..
1986 December 17 - . 17:02 GMT - . Launch Site: Plesetsk. Launch Complex: Plesetsk LC132/1. LV Family: R-14. Launch Vehicle: Kosmos 11K65M. Cosmos 1808 - . Mass: 810 kg (1,780 lb). Nation: Russia. Agency: MO. Class: Navigation. Type: Navigation satellite. Spacecraft Bus: KAUR-1. Spacecraft: Parus. USAF Sat Cat: 17239 . COSPAR: 1986-100A. Apogee: 1,019 km (633 mi). Perigee: 969 km (602 mi). Inclination: 82.90 deg. Period: 105.00 min. Military navigation satellite. Replaced Cosmos 1704, Cosmos 1598..
1987 February 18 - . 13:53 GMT - . Launch Site: Plesetsk. Launch Complex: Plesetsk LC132/2. LV Family: R-14. Launch Vehicle: Kosmos 11K65M. Cosmos 1821 - . Mass: 810 kg (1,780 lb). Nation: Russia. Agency: MO. Class: Navigation. Type: Navigation satellite. Spacecraft Bus: KAUR-1. Spacecraft: Parus. USAF Sat Cat: 17525 . COSPAR: 1987-017A. Apogee: 1,014 km (630 mi). Perigee: 960 km (590 mi). Inclination: 82.90 deg. Period: 104.90 min. Military navigation satellite..
1987 July 6 - . 21:59 GMT - . Launch Site: Plesetsk. Launch Complex: Plesetsk LC132/2. LV Family: R-14. Launch Vehicle: Kosmos 11K65M. Cosmos 1864 - . Mass: 810 kg (1,780 lb). Nation: Russia. Agency: MO. Class: Navigation. Type: Navigation satellite. Spacecraft Bus: KAUR-1. Spacecraft: Parus. USAF Sat Cat: 18160 . COSPAR: 1987-057A. Apogee: 1,005 km (624 mi). Perigee: 957 km (594 mi). Inclination: 82.90 deg. Period: 104.70 min. Military navigation satellite..
1987 October 14 - . 12:35 GMT - . Launch Site: Plesetsk. Launch Complex: Plesetsk LC133/3. LV Family: R-14. Launch Vehicle: Kosmos 11K65M. Cosmos 1891 - . Mass: 810 kg (1,780 lb). Nation: Russia. Agency: MO. Class: Navigation. Type: Navigation satellite. Spacecraft Bus: KAUR-1. Spacecraft: Parus. USAF Sat Cat: 18402 . COSPAR: 1987-087A. Apogee: 1,026 km (637 mi). Perigee: 950 km (590 mi). Inclination: 82.90 deg. Period: 104.90 min. Military navigation satellite..
1987 December 23 - . 20:22 GMT - . Launch Site: Plesetsk. Launch Complex: Plesetsk LC133/3. LV Family: R-14. Launch Vehicle: Kosmos 11K65M. Cosmos 1904 - . Mass: 810 kg (1,780 lb). Nation: Russia. Agency: MO. Class: Navigation. Type: Navigation satellite. Spacecraft Bus: KAUR-1. Spacecraft: Parus. USAF Sat Cat: 18709 . COSPAR: 1987-106A. Apogee: 1,005 km (624 mi). Perigee: 967 km (600 mi). Inclination: 82.90 deg. Period: 104.80 min. Military navigation satellite..
1988 March 22 - . 14:07 GMT - . Launch Site: Plesetsk. Launch Complex: Plesetsk LC132/1. LV Family: R-14. Launch Vehicle: Kosmos 11K65M. Cosmos 1934 - . Mass: 700 kg (1,540 lb). Nation: Russia. Agency: MO. Class: Navigation. Type: Navigation satellite. Spacecraft Bus: KAUR-1. Spacecraft: Parus. USAF Sat Cat: 18985 . COSPAR: 1988-023A. Apogee: 1,009 km (626 mi). Perigee: 947 km (588 mi). Inclination: 83.00 deg. Period: 104.60 min. Military navigation satellite..
1988 July 18 - . 22:28 GMT - . Launch Site: Plesetsk. Launch Complex: Plesetsk LC133/3. LV Family: R-14. Launch Vehicle: Kosmos 11K65M. Cosmos 1959 - . Mass: 700 kg (1,540 lb). Nation: Russia. Agency: MO. Class: Navigation. Type: Navigation satellite. Spacecraft Bus: KAUR-1. Spacecraft: Parus. USAF Sat Cat: 19324 . COSPAR: 1988-062A. Apogee: 1,006 km (625 mi). Perigee: 953 km (592 mi). Inclination: 83.00 deg. Period: 104.70 min. Military navigation satellite..
1989 February 22 - . 03:28 GMT - . Launch Site: Plesetsk. Launch Complex: Plesetsk LC132/2. LV Family: R-14. Launch Vehicle: Kosmos 11K65M. Cosmos 2004 - . Mass: 825 kg (1,818 lb). Nation: Russia. Agency: MO. Class: Navigation. Type: Navigation satellite. Spacecraft Bus: KAUR-1. Spacecraft: Parus. USAF Sat Cat: 19826 . COSPAR: 1989-017A. Apogee: 1,017 km (631 mi). Perigee: 970 km (600 mi). Inclination: 83.00 deg. Period: 105.00 min. Military navigation satellite..
1989 April 4 - . 18:36 GMT - . Launch Site: Plesetsk. Launch Complex: Plesetsk LC132/2. LV Family: R-14. Launch Vehicle: Kosmos 11K65M. Cosmos 2016 - . Mass: 825 kg (1,818 lb). Nation: Russia. Agency: MO. Class: Navigation. Type: Navigation satellite. Spacecraft Bus: KAUR-1. Spacecraft: Parus. USAF Sat Cat: 19921 . COSPAR: 1989-028A. Apogee: 1,013 km (629 mi). Perigee: 953 km (592 mi). Inclination: 83.00 deg. Period: 104.80 min. Military navigation satellite..
1989 June 7 - . 05:12 GMT - . Launch Site: Plesetsk. Launch Complex: Plesetsk LC132/2. LV Family: R-14. Launch Vehicle: Kosmos 11K65M. Cosmos 2026 - . Mass: 825 kg (1,818 lb). Nation: Russia. Agency: MO. Class: Navigation. Type: Navigation satellite. Spacecraft Bus: KAUR-1. Spacecraft: Parus. USAF Sat Cat: 20045 . COSPAR: 1989-042A. Apogee: 1,008 km (626 mi). Perigee: 951 km (590 mi). Inclination: 82.90 deg. Period: 104.70 min. Military navigation satellite..
1989 July 25 - . 07:48 GMT - . Launch Site: Plesetsk. Launch Complex: Plesetsk LC133/3. LV Family: R-14. Launch Vehicle: Kosmos 11K65M. Cosmos 2034 - . Mass: 825 kg (1,818 lb). Nation: Russia. Agency: MO. Class: Navigation. Type: Navigation satellite. Spacecraft Bus: KAUR-1. Spacecraft: Parus. Decay Date: 1989-09-30 . USAF Sat Cat: 20149 . COSPAR: 1989-059A. Apogee: 1,013 km (629 mi). Perigee: 964 km (599 mi). Inclination: 82.90 deg. Period: 104.90 min. Military navigation satellite..
1990 March 20 - . 00:25 GMT - . Launch Site: Plesetsk. Launch Complex: Plesetsk LC133/3. LV Family: R-14. Launch Vehicle: Kosmos 11K65M. Cosmos 2061 - . Mass: 825 kg (1,818 lb). Nation: Russia. Agency: MO. Class: Navigation. Type: Navigation satellite. Spacecraft Bus: KAUR-1. Spacecraft: Parus. USAF Sat Cat: 20527 . COSPAR: 1990-023A. Apogee: 1,017 km (631 mi). Perigee: 969 km (602 mi). Inclination: 82.90 deg. Period: 105.00 min. Military navigation satellite..
1990 April 20 - . 18:41 GMT - . Launch Site: Plesetsk. Launch Complex: Plesetsk LC133/3. Launch Pad: LC133/3?. LV Family: R-14. Launch Vehicle: Kosmos 11K65M. Cosmos 2074 - . Mass: 825 kg (1,818 lb). Nation: Russia. Agency: MO. Class: Navigation. Type: Navigation satellite. Spacecraft Bus: KAUR-1. Spacecraft: Parus. USAF Sat Cat: 20577 . COSPAR: 1990-036A. Apogee: 1,005 km (624 mi). Perigee: 963 km (598 mi). Inclination: 82.90 deg. Period: 104.80 min. Military navigation satellite. Positioned in plane 2 of constellation..
1990 September 14 - . 05:59 GMT - . Launch Site: Plesetsk. Launch Complex: Plesetsk LC133/3. LV Family: R-14. Launch Vehicle: Kosmos 11K65M. Cosmos 2100 - . Mass: 810 kg (1,780 lb). Nation: Russia. Agency: MO. Class: Navigation. Type: Navigation satellite. Spacecraft Bus: KAUR-1. Spacecraft: Parus. USAF Sat Cat: 20804 . COSPAR: 1990-083A. Apogee: 1,012 km (628 mi). Perigee: 958 km (595 mi). Inclination: 82.90 deg. Period: 104.80 min. Military navigation satellite..
1991 February 26 - . 04:53 GMT - . Launch Site: Plesetsk. Launch Complex: Plesetsk LC133/3. LV Family: R-14. Launch Vehicle: Kosmos 11K65M. Cosmos 2135 - . Mass: 810 kg (1,780 lb). Nation: Russia. Agency: MO. Class: Navigation. Type: Navigation satellite. Spacecraft Bus: KAUR-1. Spacecraft: Parus. USAF Sat Cat: 21130 . COSPAR: 1991-013A. Apogee: 1,018 km (632 mi). Perigee: 923 km (573 mi). Inclination: 82.80 deg. Period: 104.50 min. Military navigation satellite. Replaced by Cosmos 2195. Reactivated in August 1993 after Cosmos 2195 failed..
1991 April 16 - . 07:21 GMT - . Launch Site: Plesetsk. Launch Complex: Plesetsk LC132/1. LV Family: R-14. Launch Vehicle: Kosmos 11K65M. Cosmos 2142 - . Mass: 810 kg (1,780 lb). Nation: Russia. Agency: MO. Class: Navigation. Type: Navigation satellite. Spacecraft Bus: KAUR-1. Spacecraft: Parus. USAF Sat Cat: 21230 . COSPAR: 1991-029A. Apogee: 1,019 km (633 mi). Perigee: 960 km (590 mi). Inclination: 83.00 deg. Period: 104.90 min. Military navigation satellite. Positioned in plane 5 of constellation. Signals at 150.03 and 400.07 MHz..
1991 August 22 - . 12:35 GMT - . Launch Site: Plesetsk. Launch Complex: Plesetsk LC132/1. Launch Pad: LC132/1?. LV Family: R-14. Launch Vehicle: Kosmos 11K65M. Cosmos 2154 - . Mass: 825 kg (1,818 lb). Nation: Russia. Agency: MO. Class: Navigation. Type: Navigation satellite. Spacecraft Bus: KAUR-1. Spacecraft: Parus. USAF Sat Cat: 21666 . COSPAR: 1991-059A. Apogee: 1,008 km (626 mi). Perigee: 969 km (602 mi). Inclination: 82.90 deg. Period: 104.90 min. Military navigation satellite..
1991 November 27 - . 03:30 GMT - . Launch Site: Plesetsk. Launch Complex: Plesetsk LC133/3. LV Family: R-14. Launch Vehicle: Kosmos 11K65M. Cosmos 2173 - . Mass: 825 kg (1,818 lb). Nation: Russia. Agency: MO. Class: Navigation. Type: Navigation satellite. Spacecraft Bus: KAUR-1. Spacecraft: Parus. USAF Sat Cat: 21796 . COSPAR: 1991-081A. Apogee: 1,017 km (631 mi). Perigee: 946 km (587 mi). Inclination: 83.00 deg. Period: 104.70 min. Military navigation satellite. Positioned in plane 4 of constellation..
1992 February 17 - . 22:05 GMT - . Launch Site: Plesetsk. Launch Complex: Plesetsk LC133/3. LV Family: R-14. Launch Vehicle: Kosmos 11K65M. Cosmos 2180 - . Mass: 825 kg (1,818 lb). Nation: Russia. Agency: MO. Class: Navigation. Type: Navigation satellite. Spacecraft Bus: KAUR-1. Spacecraft: Parus. USAF Sat Cat: 21875 . COSPAR: 1992-008A. Apogee: 1,014 km (630 mi). Perigee: 960 km (590 mi). Inclination: 82.90 deg. Period: 104.90 min. Military navigation satellite. Positioned in plane 6 of constellation..
1992 April 15 - . 07:17 GMT - . Launch Site: Plesetsk. Launch Complex: Plesetsk LC132/1. LV Family: R-14. Launch Vehicle: Kosmos 11K65M. Cosmos 2184 - . Mass: 825 kg (1,818 lb). Nation: Russia. Agency: MO. Class: Navigation. Type: Navigation satellite. Spacecraft Bus: KAUR-1. Spacecraft: Parus. USAF Sat Cat: 21937 . COSPAR: 1992-020A. Apogee: 1,014 km (630 mi). Perigee: 965 km (599 mi). Inclination: 82.90 deg. Period: 104.90 min. Military navigation satellite. Positioned in plane 2 of constellation..
1992 July 1 - . 20:16 GMT - . Launch Site: Plesetsk. Launch Complex: Plesetsk LC133/3. Launch Pad: LC133/3?. LV Family: R-14. Launch Vehicle: Kosmos 11K65M. Cosmos 2195 - . Mass: 825 kg (1,818 lb). Nation: Russia. Agency: MO. Class: Navigation. Type: Navigation satellite. Spacecraft Bus: KAUR-1. Spacecraft: Parus. USAF Sat Cat: 22006 . COSPAR: 1992-036A. Apogee: 1,010 km (620 mi). Perigee: 956 km (594 mi). Inclination: 82.90 deg. Period: 104.80 min. Military navigation satellite. Positioned in plane 1 of constellation. Replaced Cosmos 2135. Failed after 12 months in orbit..
1992 October 29 - . 10:40 GMT - . Launch Site: Plesetsk. Launch Complex: Plesetsk LC133/3. LV Family: R-14. Launch Vehicle: Kosmos 11K65M. Cosmos 2218 - . Mass: 825 kg (1,818 lb). Nation: Russia. Agency: MO. Class: Navigation. Type: Navigation satellite. Spacecraft Bus: KAUR-1. Spacecraft: Parus. USAF Sat Cat: 22207 . COSPAR: 1992-073A. Apogee: 1,014 km (630 mi). Perigee: 967 km (600 mi). Inclination: 82.90 deg. Period: 104.90 min. Military navigation satellite. Positioned in plane 3 of constellation..
1993 February 9 - . 02:56 GMT - . Launch Site: Plesetsk. Launch Complex: Plesetsk LC133/3. LV Family: R-14. Launch Vehicle: Kosmos 11K65M. Cosmos 2233 - . Mass: 825 kg (1,818 lb). Nation: Russia. Agency: MO. Class: Navigation. Type: Navigation satellite. Spacecraft Bus: KAUR-1. Spacecraft: Parus. USAF Sat Cat: 22487 . COSPAR: 1993-008A. Apogee: 1,010 km (620 mi). Perigee: 951 km (590 mi). Inclination: 82.90 deg. Period: 104.70 min. Military navigation satellite. Positioned in plane 5 of constellation. Replaced Cosmos 2142..
1993 April 1 - . 18:57 GMT - . Launch Site: Plesetsk. Launch Complex: Plesetsk LC133/3. LV Family: R-14. Launch Vehicle: Kosmos 11K65M. Cosmos 2239 - . Mass: 825 kg (1,818 lb). Nation: Russia. Agency: MO. Class: Navigation. Type: Navigation satellite. Spacecraft Bus: KAUR-1. Spacecraft: Parus. USAF Sat Cat: 22590 . COSPAR: 1993-020A. Apogee: 997 km (619 mi). Perigee: 966 km (600 mi). Inclination: 82.90 deg. Period: 104.70 min. Military navigation satellite. Positioned in plane 4 of constellation. Replaced Cosmos 2173..
1993 November 2 - . 12:10 GMT - . Launch Site: Plesetsk. Launch Complex: Plesetsk LC132/1. LV Family: R-14. Launch Vehicle: Kosmos 11K65M. Cosmos 2266 - . Mass: 825 kg (1,818 lb). Nation: Russia. Agency: MO. Class: Navigation. Type: Navigation satellite. Spacecraft Bus: KAUR-1. Spacecraft: Parus. USAF Sat Cat: 22888 . COSPAR: 1993-070A. Apogee: 1,020 km (630 mi). Perigee: 947 km (588 mi). Inclination: 83.00 deg. Period: 104.80 min. Military navigation satellite. Positioned in plane 1 of constellation. Signals at 149.97 and 399.92 MHz..
1994 April 26 - . 02:14 GMT - . Launch Site: Plesetsk. Launch Complex: Plesetsk LC133/3. LV Family: R-14. Launch Vehicle: Kosmos 11K65M. Cosmos 2279 - . Mass: 825 kg (1,818 lb). Nation: Russia. Agency: MO. Class: Navigation. Type: Navigation satellite. Spacecraft Bus: KAUR-1. Spacecraft: Parus. USAF Sat Cat: 23092 . COSPAR: 1994-024A. Apogee: 1,007 km (625 mi). Perigee: 956 km (594 mi). Inclination: 83.00 deg. Period: 104.70 min. Military navigation satellite. Positioned in plane 6 of constellation..
1995 March 22 - . 04:09 GMT - . Launch Site: Plesetsk. Launch Complex: Plesetsk LC132/1. LV Family: R-14. Launch Vehicle: Kosmos 11K65M. Cosmos 2310 - . Mass: 825 kg (1,818 lb). Nation: Russia. Agency: MO. Class: Navigation. Type: Navigation satellite. Spacecraft Bus: KAUR-1. Spacecraft: Parus. USAF Sat Cat: 23526 . COSPAR: 1995-012A. Apogee: 1,010 km (620 mi). Perigee: 980 km (600 mi). Inclination: 82.90 deg. Period: 105.00 min. Military navigation satellite. Positioned in plane 2 of constellation..
1995 October 6 - . 03:23 GMT - . Launch Site: Plesetsk. Launch Complex: Plesetsk LC132/1. LV Family: R-14. Launch Vehicle: Kosmos 11K65M. Cosmos 2321 - . Mass: 825 kg (1,818 lb). Nation: Russia. Agency: MO. Class: Navigation. Type: Navigation satellite. Spacecraft Bus: KAUR-1. Spacecraft: Parus. Decay Date: 1997-08-21 . USAF Sat Cat: 23676 . COSPAR: 1995-052A. Apogee: 754 km (468 mi). Perigee: 256 km (159 mi). Inclination: 82.90 deg. Period: 87.10 min. Second stage anomaly; failed to reach desired orbit; military navigation..
1996 January 16 - . 15:33 GMT - . Launch Site: Plesetsk. Launch Complex: Plesetsk LC132/1. LV Family: R-14. Launch Vehicle: Kosmos 11K65M. Cosmos 2327 - . Mass: 825 kg (1,818 lb). Nation: Russia. Agency: MO. Class: Navigation. Type: Navigation satellite. Spacecraft Bus: KAUR-1. Spacecraft: Parus. USAF Sat Cat: 23773 . COSPAR: 1996-004A. Apogee: 1,020 km (630 mi). Perigee: 950 km (590 mi). Inclination: 83.00 deg. Period: 104.80 min. Military navigation satellite. Positioned in plane 1 of constellation..
Cosmos 2334 - . Mass: 825 kg (1,818 lb). Nation: Russia. Agency: MO. Class: Navigation. Type: Navigation satellite. Spacecraft Bus: KAUR-1. Spacecraft: Parus. USAF Sat Cat: 24304 . COSPAR: 1996-052A. Apogee: 1,011 km (628 mi). Perigee: 966 km (600 mi). Inclination: 82.90 deg. Period: 104.90 min. Military navigation satellite. Positioned in plane 1 of constellation. Signals at 150.03 MHz and 400.08 MHz..
1996 December 20 - . 06:43 GMT - . Launch Site: Plesetsk. Launch Complex: Plesetsk LC132/1. LV Family: R-14. Launch Vehicle: Kosmos 11K65M. Cosmos 2336 - . Mass: 825 kg (1,818 lb). Nation: Russia. Agency: MO. Class: Navigation. Type: Navigation satellite. Spacecraft Bus: KAUR-1. Spacecraft: Parus. USAF Sat Cat: 24677 . COSPAR: 1996-071A. Apogee: 1,012 km (628 mi). Perigee: 979 km (608 mi). Inclination: 82.90 deg. Period: 105.00 min. Military navigation satellite. Positioned in plane 4 of constellation. Signals at 149.97 and 399.92 MHz..
1997 September 23 - . 16:44 GMT - . Launch Site: Plesetsk. Launch Complex: Plesetsk LC132/1. LV Family: R-14. Launch Vehicle: Kosmos 11K65M. Cosmos 2346 - . Mass: 825 kg (1,818 lb). Nation: Russia. Agency: MO. Manufacturer: Reshetnev bureau. Class: Navigation. Type: Navigation satellite. Spacecraft Bus: KAUR-1. Spacecraft: Parus. USAF Sat Cat: 24953 . COSPAR: 1997-052A. Apogee: 997 km (619 mi). Perigee: 937 km (582 mi). Inclination: 82.90 deg. Period: 104.40 min. Military navigation satellite..
2002 May 28 - . 18:15 GMT - . Launch Site: Plesetsk. Launch Complex: Plesetsk LC132/1. LV Family: R-14. Launch Vehicle: Kosmos 11K65M. Cosmos 2389 - . Mass: 825 kg (1,818 lb). Nation: Russia. Agency: VKS. Manufacturer: Reshetnev bureau. Class: Navigation. Type: Navigation satellite. Spacecraft Bus: KAUR-1. Spacecraft: Parus. USAF Sat Cat: 27436 . COSPAR: 2002-026A. Apogee: 1,017 km (631 mi). Perigee: 949 km (589 mi). Inclination: 83.00 deg. Period: 104.80 min. The Kosmos-3M rocket entered a transfer orbit of about 150 x 1000 km x 83 deg at about 1823 UTC; a second burn at apogee around 1905 UTC circularized the orbit at 950 x 1016 km. The Parus navigation satellite was placed in Plane 4, probably replacing Cosmos 2336; it was between the planes of Cosmos 2366 and Cosmos 2361. 2003 June 4 - . Launch Site: Plesetsk. Launch Complex: Plesetsk LC132/1. LV Family: R-14. Launch Vehicle: Kosmos 11K65M. Cosmos 2398 - . Mass: 820 kg (1,800 lb). Nation: Russia. Agency: VKS. Manufacturer: Reshetnev bureau. Class: Navigation. Type: Navigation satellite. Spacecraft Bus: KAUR-1. Spacecraft: Parus. USAF Sat Cat: 27818 . COSPAR: 2003-023A. Apogee: 1,016 km (631 mi). Perigee: 970 km (600 mi). Inclination: 83.00 deg. Period: 105.00 min. 2004 July 22 - . 17:46 GMT - . Launch Site: Plesetsk. Launch Complex: Plesetsk LC132/1. LV Family: R-14. Launch Vehicle: Kosmos 11K65M. Cosmos 2407 - . Mass: 820 kg (1,800 lb). Nation: Russia. Agency: KVR. Class: Navigation. Type: Navigation satellite. Spacecraft Bus: KAUR-1. Spacecraft: Parus. USAF Sat Cat: 28380 . COSPAR: 2004-028A. Apogee: 1,007 km (625 mi). Perigee: 951 km (590 mi). Inclination: 83.00 deg. Period: 104.70 min. 2005 January 20 - . 03:00 GMT - . Launch Site: Plesetsk. Launch Complex: Plesetsk LC132/1. LV Family: R-14. Launch Vehicle: Kosmos 11K65M. Cosmos 2414 - . Mass: 820 kg (1,800 lb). Nation: Russia. Agency: KVR. Class: Navigation. Type: Navigation satellite. Spacecraft Bus: KAUR-1. Spacecraft: Parus. USAF Sat Cat: 28521 . COSPAR: 2005-002A. Apogee: 968 km (601 mi). Perigee: 908 km (564 mi). Inclination: 83.00 deg. Period: 103.80 min. Military navigation satellite. Positioned in plane 4 of constellation, replacement for Cosmos 2239?. 2005 June 21 - . 19:46 GMT - . Launch Site: Barents Sea Launch Area. Launch Pad: 69.5 N x 34.2 E. Launch Platform: K-496. LV Family: R-29. Launch Vehicle: Volna. FAILURE: Failure. Cosmos 1 - . Payload: Solnechny Parus. Mass: 103 kg (227 lb). Nation: USA. Agency: Planetary Society. Manufacturer: Lavochkin bureau. Class: Technology. Type: Navigation technology satellite. Spacecraft Bus: KAUR-1. Spacecraft: Parus. Launched from SSBN Borisoglebsk. First orbital flight attempt of converted SLBM. Payload was solar sail demonstrator. Delayed from late 2001; March 20 and October 2002; late March, August 28 and October, 2003; February, March, April 6, May 20 and 31, 2005. 2007 September 11 - . 13:05 GMT - . Launch Site: Plesetsk. Launch Complex: Plesetsk LC132/1. LV Family: R-14. Launch Vehicle: Kosmos 11K65M. Cosmos 2429 - . Mass: 820 kg (1,800 lb). Nation: Russia. Agency: KVR. Class: Navigation. Type: Navigation satellite. Spacecraft Bus: KAUR-1. Spacecraft: Parus. USAF Sat Cat: 32052 . COSPAR: 2007-038A. Apogee: 999 km (620 mi). Perigee: 956 km (594 mi). Inclination: 83.00 deg. Period: 104.60 min. Military navigation satellite. Replenishment launch for Russian navigation satellite constellation. Six satellites were needed to maintain minimum operational capability..
2009 July 21 - . 03:57 GMT - . Launch Site: Plesetsk. Launch Complex: Plesetsk LC132/1. LV Family: R-14. Launch Vehicle: Kosmos 11K65M. Cosmos 2454 - . Mass: 820 kg (1,800 lb). Nation: Russia. Agency: KVR. Class: Navigation. Type: Navigation satellite. Spacecraft Bus: KAUR-1. Spacecraft: Parus. USAF Sat Cat: 35635 . COSPAR: 2009-039A. Apogee: 944 km (586 mi). Perigee: 918 km (570 mi). Inclination: 83.00 deg. Period: 103.60 min. 2010 April 27 - . 01:05 GMT - . Launch Site: Plesetsk. Launch Complex: Plesetsk LC132/1. LV Family: R-14. Launch Vehicle: Kosmos 11K65M. Cosmos 2463 - . Mass: 820 kg (1,800 lb). Nation: Russia. Agency: KVR. Class: Navigation. Type: Navigation satellite. Spacecraft Bus: KAUR-1. Spacecraft: Parus. USAF Sat Cat: 36519 . COSPAR: 2010-017A. Apogee: 1,023 km (635 mi). Perigee: 967 km (600 mi). Inclination: 83.00 deg. Period: 105.00 min.